David Brooks, New York Times columnist, has a piece up called The Sandra Bullock Trade which talks about how fame and fortune are no match for a good marriage. I agree with David on that one and consider myself very lucky to have found such a wonderful person as The Gotham Gal to spend my time on earth with. month produces the same happiness gain as doubling your income. Our portfolio company Meetup.com is a bargain because you can join any group you want for free. It may cost you a small fee to attend the meetup but many of them are free to attend too. If you want to test this "joining a meetup group is better than doubling your income", go here and find one and see what you think. I suspect Facebook and Twitter will both end up north of 80% once their internationalization efforts are fully realized. Facebook is a lot farther along that path than Twitter but it seems like Twitter is growing like a weed outside the US right now. 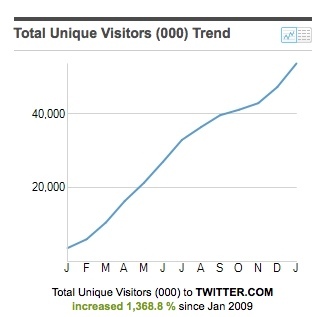 This is a Comscore chart of Twitter's non-US traffic through February 2010. Even if international traffic could only be monetized 25% as well as US traffic, when your international traffic is 80% of your total traffic, you would make as much money internationally as domestically. So that's a lot of potential out there to be tapped. And of course, not every international market is equal when it comes to monetization. Markets like western europe and japan monetize very well today. Emerging markets like the BRIC countries (Brazil, Russia, China, and India) should be big opportunities for monetization this decade. Other markets may be tough for years to come. There's a lot of money "rest of world" and I suspect that will only be more and more true over time. So we should start building web businesses with that in mind. There is a big banking reform bill working its way through the Senate right now. It is sponsored by Chris Dodd, Chairman of the Senate Banking Committee. It has a long name I can't remember, so I'll call it the Dodd Banking Bill. 1) Changing the definition of a "qualified investor" in angel and venture deals. Not just anyone can invest in a startup company. You have to be a qualified investor. A qualified investor is currently defined as anyone with a net worth of over $1mm or net income of over $250k. Dodd's bill would increase that to $2.3mm and $450k respectively. And then index those numbers to inflation. 2) Eliminate the existing federal pre-emption over state regulation of "accredited offerings." Angel and venture financings could be regulated state by state creating a fairly burdensome set of rules and regulations that each financing would need to be subject to. Currently there is a federal pre-emption that makes getting these kinds of deals done fairly easy. I have no idea why either of these provisions ended up in a bill designed to regulate the banking industry. Entrepreneurs and startups don't use banks to finance them. They get their initial capital from angel investors and then VCs as they grow. This system works well, did not blow up in 2008, and is not in need of reform of the type Dodd wants to throw at us. In fact, what we need is to eliminate all accredited investor requirements for small investments of up to $25k. Why does someone have to be a millionaire to invest in a friend's startup? I understand that we don't want someone mortgaging their home, or betting their entire life's savings on a startup. But for a small amount, like $25k, we should not be regulating angel investing. My dad sent me an email the other day pointing out a news story about an incubator in Texas that was cranking out startups and creating jobs. He told me that he believes that the work entrepreneurs and the people who work with them (ie me) are doing is incredibly important to the health of our economy. He's right and we need to explain that to Chris Dodd and his friends in the Senate. If they are going to reform accredited investor regulations, they should liberalize them, not constrain them further. I'll get on the phone and call my Senators and Representatives. Hopefully you'll do the same. This is nonsense. The section numbers in question are Sec. 412 for accredited investors and Sec. 926 for federal pre-emption or Reg D.
UPDATE #2: Dan Primack of PE Hub has just posted that congress is listening to all the uproar over this. Maybe we'll get to keep things the way they are. But I am still going to make the case that we need an exclusion for small investments made by non-qualified investors. A few weeks ago I wrote a blog post about the way I plan to setup the voice service in our new home. I'd link to that post but I'm typing this out on my blackberry at 30,000 feet on my way to San Francisco this morning. That post generated a lot of comments. I can't go online and check but I recall it was close to two hundred. The discussion helped me out immensely and I want to thank everyone who contributed to the discussion. In particular, I took away two big things; try to use mobile as the primary voice service in the home, and use ATAs as a bridge between traditional telephony handsets and SIP/VOIP. Both of those takeaways are going to make it into whatever we end up doing. I still plan to use a cloud PBX provider to host and route our numbers and calls and provide dial tone to the non cell phone handsets in our home. There were about twenty such providers suggested in the comment thread. I have made a list and am working my way through them. Three of the suggested providers actually weighed in on the comments. All three avoided pitching their wares and simply offered a name and number to call if I wanted to learn more. I thought that was a great move by all three and as a result, they are at the top of my list to check out. I may end up going with some other provider in the end but the social media smarts exhibited by these three providers impressed me and is an example of how social media can and should be part of every company's marketing strategy. I'm on vacation this week and trying to keep work to a minimum. And I've got a post up on the USV blog today bidding goodbye to our colleague Andrew Parker. So I simply going to link to that post. It's an interesting post because in addition to talking about how great it has been to work with Andrew, I explain a bit about how we think about staffing our firm. If you have any comments, please leave them on the USV post. I'm on vacation this week skiing with my family. I got back from the mountain yesterday afternoon, checked in on email, made a few phone calls, and took a quick look at Techmeme. I saw a headline that said "The Startup Visa Act Must Be Stopped" and I noticed that the post was written by a member of the AVC community, Pascal-Emmanuel Gobry, and that is was running on Business Insider. I know Pascal. We met once briefly and I engage with him regularly here and also on Tumblr. He's a smart and thoughtful person. So I read his post carefully, thought about it, and slept on it. Those are all valid arguments and I appreciate that he is raising them. But to suggest that the Startup Visa Act "must be stopped" because of them is ridiculous. In early 2009, I suggested that the two founders move, at least temporarily, to the US so that they could build out the business side of the company here. They did so, but only on a tourist visa. And when that tourist visa ran out, both of them had to go back to Slovenia and wait a long time to get a more permanent visa. Both are now back in the US building the business, but the time they were kept out of the US was a critical time in the business and the company suffered from having them away. Time was lost and you can't get that back. Pascal is thinking about this a binary choice and it is not. We have a suboptimal visa system here in the US for entrepreneurs. The startup visa will not solve all the problems. It is not a perfect solution. But it is a very good idea and it should not be "stopped." It should be made into law. Then entrepreneurs like Pascal can decide if they want to take advantage of it or not. While I do not appreciate the headline that Business Insider put on Pascal's post (much as I don't like the headlines they sometimes put on my posts when the re-run them), I do appreciate the debate over the Startup Visa Act. Anything that is going to become the law of the land should be subject to debate. If you go back to my post on Accounting, you will recall that there are two kinds of accounts in a company's chart of accounts; revenue and expense accounts and asset and liability accounts. Let's start from the top and work our way down. The top line, cash, is the single most important item on the balance sheet. Cash is the fuel of a business. If you run out of cash, you are in big trouble unless there is a "filling station" nearby that is willing to fund your business. Alan Shugart, founder of Seagate and a few other disk drive companies, famously said "cash is more important than your mother." That's how important cash is and you never want to get into a situation where you run out of it. The second line, short term investments, is basically additional cash. Most startups won't have this line item on their balance sheet. But when you are Google and are sitting on $24bn of cash and short term investments, it makes sense to invest some of your cash in "short term instruments". Hopefully for Google and its shareholders, these investments are safe, liquid, and are at very minimal risk of loss. The next line is "accounts receivable". Google calls it "net receivables' because they are netting out money some of their partners owe them. I don't really know why they are doing it that way. But for most companies, this line item is called Accounts Receivable and it is the total amount of money owed to the business for products and services that have been delivered but have not been collected. It's the money your customers owe your business. If this number gets really big relative to revenues (for example if it represents more than three months of revenues) then you know something is wrong with the business. We'll talk more about that in an upcoming post about financial statement analysis. I'm only going to cover the big line items in this balance sheet. So the next line item to look at is called Total Current Assets. That's the amount of assets that you can turn into cash fairly quickly. It is often considered a measure of the "liquidity of the business." The next set of assets are "long term assets" that cannot be turned into cash easily. I'll mention three of them. Long Term Investments are probably Google's minority investments in venture stage companies and other such things. The most important long term asset is "Property Plant and Equipment" which is the cost of your capital equipment. For the companies we typically invest in, this number is not large unless they rack their own servers. Google of course does just that and has spent $4.8bn to date (net of depreciation) on its "factory". Depreciation is the annual cost of writing down the value of your property plant and equipment. It appears as a line in the profit and loss statement. The final long term asset I'll mention is Goodwill. This is a hard one to explain. But I'll try. When you purchase a business, like YouTube, for more than it's "book value" you must record the difference as Goodwill. Google has paid up for a bunch of businesses, like YouTube and Doubleclick, and it's Goodwill is a large number, currently $4.9bn. If you think that the value of any of the businesses you have acquired has gone down, you can write off some or all of that Goodwill. That will create a large one time expense on your profit and loss statement. After cash, I believe the liability section of the balance sheet is the most important section. It shows the businesses' debts. And the other thing that can put you out of business aside from running out of cash is inability to pay your debts. That is called bankruptcy. Of course, running out of cash is one reason you may not be able to pay your debts. But many companies go bankrupt with huge amounts of cash on their books. So it is critical to understand a company's debts. The main current liabilities are accounts payable and accrued expenses. Since we don't see any accrued expenses on Google's balance sheet I assume they are lumping the two together under accounts payable. They are closely related. Both represent expenses of the business that have yet to be paid. The difference is that accounts payable are for bills the company receives from other businesses. And accrued expenses are accounting entries a company makes in anticipation of being billed. A good example of an accounts payable is a legal bill you have not paid. A good example of an accrued expense is employee benefits that you have not yet been billed for that you accrue for each month. If you compare Current Liabilities to Current Assets, you'll get a sense of how tight a company is operating. Google's current assets are $29bn and its current liabilities are $2.7bn. It's good to be Google, they are not sweating it. Many of our portfolio companies operate with these numbers close to equal. They are sweating it. Non current liabilities are mostly long term debt of the business. The amount of debt is interesting for sure. If it is very large compared to the total assets of the business its a reason to be concerned. But its even more important to dig into the term of the long term debt and find out when it is coming due and other important factors. You won't find that on the balance sheet. You'll need to get the footnotes of the financial statements to do that. Again, we'll talk more about that in a future post on financial statement analysis. The next section of the balance sheet is called Stockholders Equity. This includes two categories of "equity". The first is the amount that equity investors, from VCs to public shareholders, have invested in the business. The second is the amount of earnings that have been retained in the business over the years. I'm not entirely sure how Google breaks out the two on it's balance sheet so we'll just talk about the total for now. Google's total stockholders equity is $36bn. That is also called the "book value" of the business. The cool thing about a balance sheet is it has to balance out. Total Assets must equal Total Liabilities plus Stockholders Equity. In Google's case, total assets are $40.5bn. Total Liabilities are $4.5bn. If you subtract the liabilities from the assets, you get $36bn, which is the amount of stockholders equity. We'll talk about cash flow statements next week and the fact that a balance sheet has to balance can be very helpful in analyzing and projecting out the cash flow of a business.